Morning drive from Rawalpindi / Islamabad to Murree continues on ward drive to Nathiagali. Enjoy the natural beauty in the area. One can have 4 kms pipeline trek from Dunga-gali to Ayubia or Dungagali to Mushkpuri or Nathiagali to Mushkpuri. Nathiagali is situated at a distance of 35 kms from Murree hills. As well as from Abbottabad one can reach to Nathiagali. It provides superb picturesque views. Governor House, Chief Minister’s House and forest offices and other departments of Government of Khyber Pukhtunkhwa, Nathiagali practically serves as summer capital of the province. It is linked with Abbottabad city on one hand and on the other hand is linked with Murree & onwards up to capital city Islamabad via constructed and marvelously placed Expressway. There is quite large number of hotels and restaurants of a variety of categories in the town along with rest houses of different departments. Other amenities like Banks, internet cafe, hospital, fuel station and workshops are also available. Ayubia has turned into the most important spot in Galliat after Nathiagali. Ayubia’s celebrity is 3 kms stretched Chairlift which was fixed at the spot in 1962. 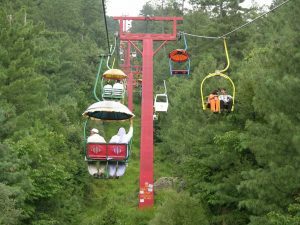 The chairlift takes one to Gora Dhaka or Horse Mountain which is one of the highest spot in the area. At the Gora Dhaka a good-looking Park and a Motel with restaurant has been built which bestow panoramic view all around.